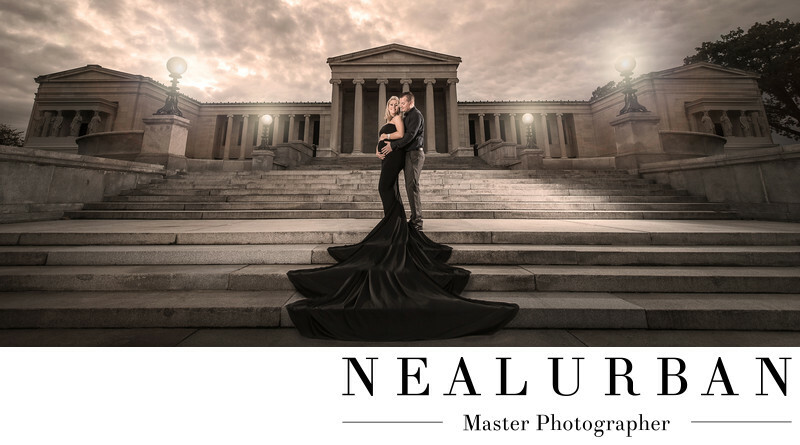 Nina and Greg looked amazing for this maternity session at Albright Knox Art Gallery. Nina had a gorgeous dress for this part of the session. Look at how long that train is! It took us a while to get it perfectly to cascade down the stairs. Every time I had it perfect, there was a little wind gust that moved it. The day was chilly and looked stormy. The clouds were starting to break up and let some of the sun peek through.The lights at the Gallery were just turning on as well. This helped with giving us a glowing back light on these parents-to-be. We had Nina and Greg do a little prom pose so Greg could have his hands on the bump too! Then they leaned into one another. We had to use some light to brighten them up a bit. We used two lights for that. The framing is so nice in this image too. Neal shot from a lower angle on the ground to give the stairs a steeper effect leading up to the building and sky. This maternity image and style went great with all of the other sessions we have done for this couple. We photographed their high fashion engagement session down in Wilson, NY with boats and water in the back ground. The wedding was at the beautiful Statler in Buffalo. Nina loved the chandeliers and really classic look. We had to have the maternity session keep the same vibe and style! Location: 1285 Elmwood Ave Buffalo NY 14222.